The North Carolina Museum of History will debut a new exhibit in its permanent North Carolina exhibit Dec. 17, 2016. The exhibit will be located under the museum’s 1903 Wright Flyer reproduction. The backdrop sets the theme of life in Kitty Hawk when the Wrights were conducting their glider and flyer experiments. The exhibit extends the museum’s work on the Wright story begun in 2014 through its relationship with the First Flight Foundation. The exhibit includes vintage clothing returned and repurposed from an exhibit the Foundation sponsored at the US Air Force Academy, Colorado Springs, CO, for the Class of 2015 Exemplar program. The academy’s class of 2015 selected the Wrights as their class exemplar, that person (s) they wish to most model in their career. The Wrights are the only civilians selected for this honor. In March 2014, the Foundation awarded a grant of $150,000 to the museum’s foundation for the purchase and installation of the Wright 1911 glider, the last machine the Wrights flew in Kitty Hawk, NC. 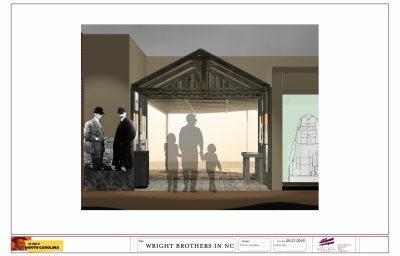 This was the initial piece of a desired collaboration to tell the complete Wright Brothers North Carolina story including providing the museum with reproductions of all the Wrights’ North Carolina machines-the 1900 box kite, gliders of 1901 and 1902, and 1908 aeroplane. The museum has a reproduction of the 1903 Wright flyer in the permanent North Carolina exhibit. The collaboration added a new element with discussions beginning late 2015 and continuing to the present, for the museum to host and display the reproductions of the 1902 Wright glider and the 1903 Wright Flyer (commissioned by the late aviation enthusiast Harry Combs for the 2003 centennial) of the National Park Service’s Wright Brothers National Memorial (WBNM). The WBNM visitor center will close October 2016 for a two-year renovation. This collaborative partnership will ensure the Wright machines remain in North Carolina and permit new audiences to see the machines and learn more about North Carolina’s adopted sons and North Carolina’s aviation history. The 1903 Wright Flyer will return to the WBNM visitor center in 2018. It will be replaced by the Wright 1908 aeroplane commissioned by the Foundation.